Vittal Mallya Scientific Research Foundation organization is equipped with well maintained small animal house facility required for basic research studies. The animal house registered under CPCSEA, Government of India. All experimental design and research plan procedures used are approved by Institutional Animal Ethics Committee (IAEC). 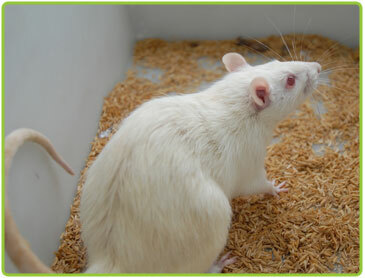 The Animal House Facility maintains Swiss albino strain of mice and Wistar rats. The animal rooms are maintained at 22±3ºC with a relative humidity of 50-60%. A 12-hour light-dark cycle is maintained with automatic timers. A trained veterinarian carries out breeding and regular health monitoring of all animals to ensure that they are free from contagious diseases. To prevent the transmission of infection, standard hygienic procedures such as use of sterilized bedding, autoclaved cages, zero bacteria / autoclaved drinking water and handling of animals using gloved hands are followed.